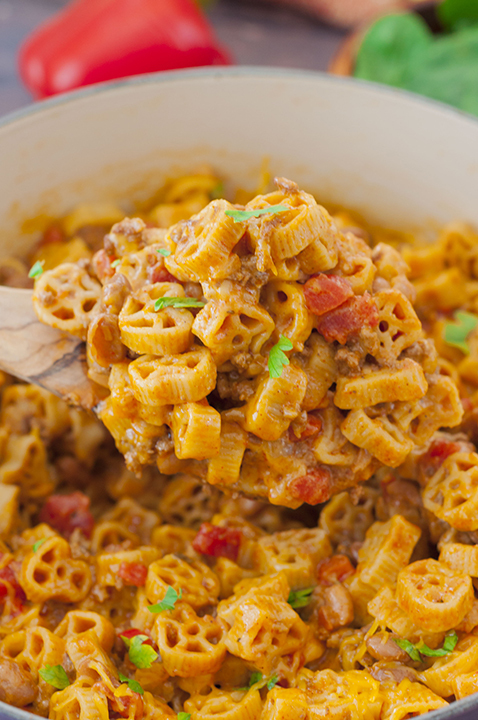 Easy One Pot Chili Mac and Cheese combines two of my favorite foods: mac ‘n cheese and chili. You get the best of both worlds with this hearty dinner with gooey cheese that takes less than a half hour to make! Ahhhh one pot meals. Really…is there anything better? 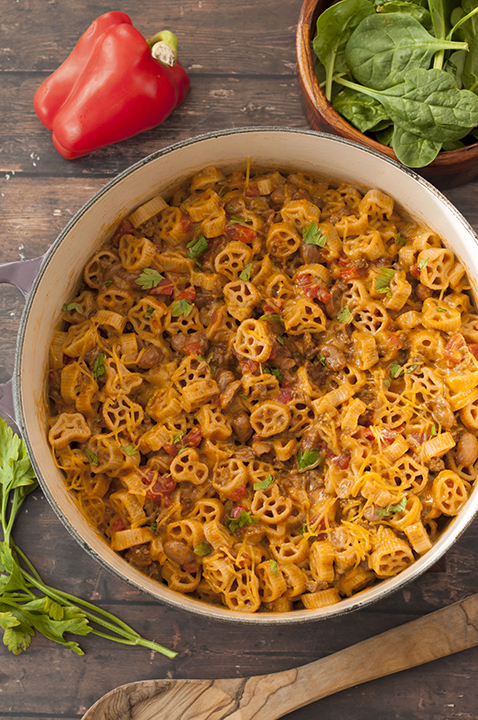 I love that this One Pot Chili Mac and Cheese has it all: protein, meat, beans, and cheese. The weather is starting to cool down according to the forecast here in Rochester and this comfort food meal really hit the spot. Serve it with a side salad and dinner is done in just 30 minutes! Your whole family will go crazy for this meal. It reminded me a lot of my Sloppy Joe Macaroni and Cheese which is an all-time favorite meal of ours. I incorporated my favorite brand of diced tomatoes (Tuttorosso) into this recipe to save me time on the dicing and slicing. I’m all about a time saver here and there in the kitchen while cooking as much as I can from scratch. This One Pot Chili Mac and Cheese smelled sooo good while it was cooking that I need to get it on the table ASAP! I tend to always have Tuttorosso products in my pantry because they are honestly the best-tasting tomato products out there. It helps that this brand is what my dad always used while I was growing up so I learned from one of the best Italian cooks around! Their really bright green label is always easy to find in the stores and they are the best-selling Italian inspired canned tomato brand in the U.S. I really encourage you to give their all natural tomato products a try if you have not already! I also use their tomatoes in my One Pot Cheesy Tortellini Skillet. I love that it’s the pride and care of their family-owned business that drives them to do the right thing such as sustainability in producing their canned tomatoes, using non-GMO ingredients and non-BPA lined cans. 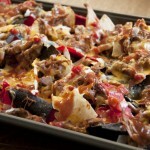 I share 2-3 new recipes weekly here on Wishes and Dishes. Sometimes it’s easy to take for granted the abundance of food my family has access to and forget that not everyone has a meal to enjoy each day. Hunger impacts families across the nation and we need to always be aware of this and appreciate what we have. Did you know that 1 in 8 households do not know where their next meal is going to come from? Shocking, right? It’s easy to forget how fortunate we are just to put meals on the table each and every day. For the month of October, Red Gold (Tuttorosso’s parent company) and Feeding America teamed up to launch the 2nd Annual Red Gold Crush Hunger campaign. This campaign focuses on encouraging families to share a family meal to help crush hunger. For every Red Gold, Tuttorosso, Redpack, or Huy Fong product bought this month, Red Gold donates a meal to someone in need. I love how easy they are making it to help someone less fortunate! You can simply buy one can and put a meal on the table for someone who would otherwise not have one! The ultimate goal is to donate 2 million meals to Feeding America food banks across the U.S. Let’s help as much as we can! I bought a few cans today to help do my part because I don’t want to take my food in the grocery cart for granted ever again. Remember: 1 can = 1 meal! I hope you will visit HelpCrushHunger.com or join the conversation on social media to #HelpCrushHunger. Tip: Tuttorosso products can be found on Amazon or use their store locator to see where you can get their products at a store near you! Easy One Pot Chili Mac and Cheese combines two of my favorite foods: mac 'n cheese and chili. This hearty dinner that takes less than a half hour to make! Using a large pot (5 or 6 quart) with a lid add olive oil and heat over medium-high heat. Add ground beef. Cook until beef is no longer pink. Stir in onion, garlic, bell pepper, tomato paste, chili powder, cumin, paprika, oregano, and sea salt, until onion and pepper start to soften, and garlic becomes fragrant. 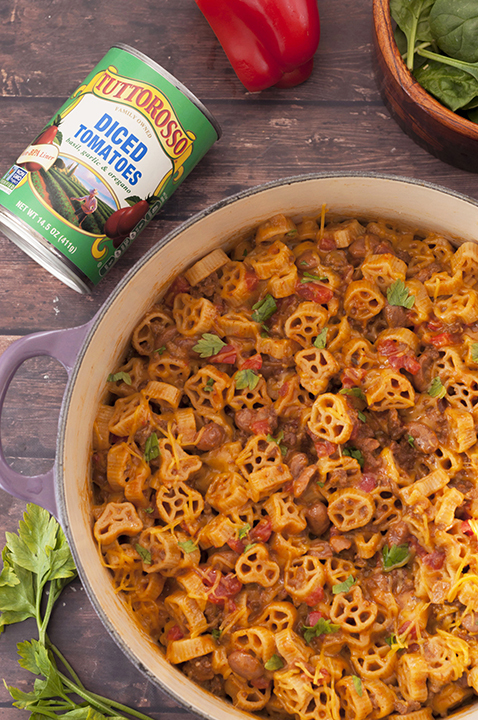 Add diced tomatoes with juice, canned pinto beans, beef stock, half and half, and macaroni. Stir until well combined. Bring this to a simmer, then reduce heat to low and cover. Cook for 13-15 minutes or until pasta is cooked through, but not mushy. Turn off heat, and stir in cheddar cheese until it is fully melted. Garnish with chopped fresh parsley, if desired. Enjoy while hot! What an awesome one-pot meal! Mac and cheese is definitely a favorite at our house, so this sounds like it would definitely be a hit! Love this dish! So nice and satisfying, isn’t it? 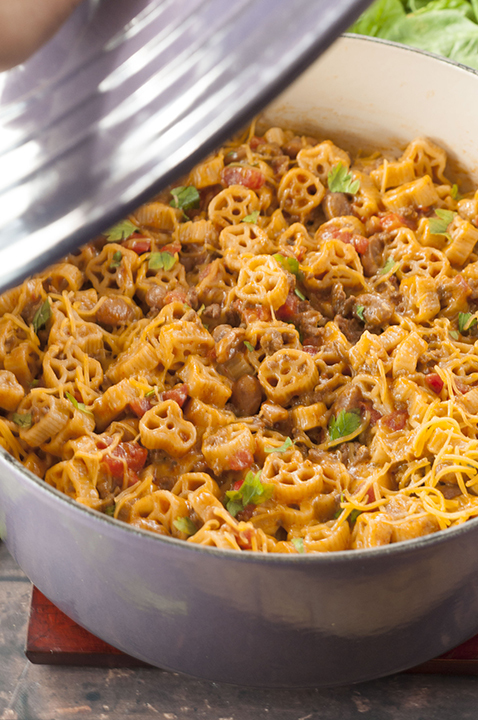 And love the wagon wheel pasta you used — such a fun shape! Thanks so much. This is definitely the perfect comfort meal! I love that it is a one pot and 30 minute meal! Doesn’t get any better than that in my book! This looks really good. I am not a huge chili fan, but this seems more “pasta” than “chili”, so definitely giving it a try soon. Also, it’s always nice to be reminded how fortunate we are to have what we do. It’s easy to forget the abundance and security with which many of us are blessed. That IS a lot of protein! I’ve never seen the Tuttorosso brand before, maybe it’s an east coast brand? Love what they’re doing as a good deed though! Wish all companies would do their part. 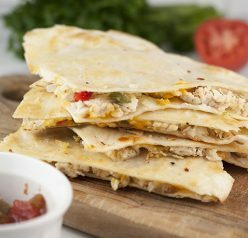 I love quick and tasty weeknight meals like this, sounds delicious! 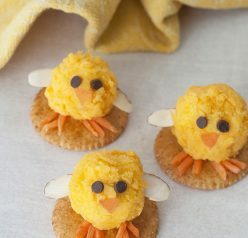 What a fun recipe, my son is going to love this! I could eat this all the live long day. One pot meals make life so much easier.